In April I started a new job working on a Seekrit Internet Project. Until said SIP launches – at which time I will tell you all about it – I have had precious little time to blog, preferring to spend my non-working hours cooking and occasionally sleeping. I contimue to try new things, but sometimes the new things are dropped into my lap by random chance. After reading a Hainanese chicken rice recipe in Lucky Peach, I decided to locate a key ingredient: pandan leaves. Rather than brave the crowds at H Mart on a weekend, I visited the Cambodian farm stand at the Union Square Farmer’s Market. If anyone had an exotic vegetable, it would be this family. They didn’t have pandan leaves, but one of the other shoppers heard me asking for them and asked me what I would use them for. I had neve heard of a chicken rice mix, and had a hard time imagining what steps in the recipe could be replaced by something in a box. After a few more minutes of chatting about her favorite chicken rice place, I continued with my shopping while She Who Must Be Obeyed headed off to her hair appointment. Two hours later (she has special hair) She Who told me about a conversation she had with the woman in the chair next to hers. This person was from Singapore and visiting her daughter. The inevitable question about chicken rice was asked, and once again we learned that Singapore locals use mixes. This woman took our address and offered to send us some samples. I hope this “food” parcel finds you and your family in good health. It was good to make your acquaintance … a pleasant surprise indeed to find someone on the other side of the world talking about Hainanese chicken rice!! It shows how “small” the world really is this day and age. I told my husband about you and we’ve decided to get you 3 other Singaporean popular dishes – chili crab, curry chicken, and laksa. I believe it is easy for you to get the required ingredients. Let us know how the dishes turn out and which you like or do not quite fancy. It was time to make chicken rice. 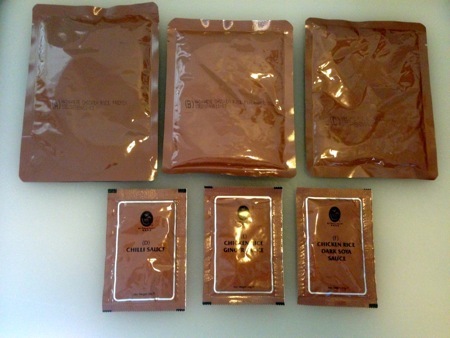 The contents of the box resembled MRE pouches (left to right, top to bottom: premix, fragrance oil, sesame soy sauce oil, chili sauce, ginger sauce, and dark soy sauce). 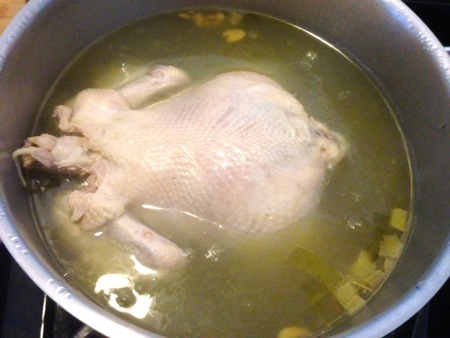 I added the premix to water, brought it to a boil, and added the chicken, which I simmered for 30 minutes. The premix was probably powdered chicken stock with ginger and garlic, and dried pandan leaves. 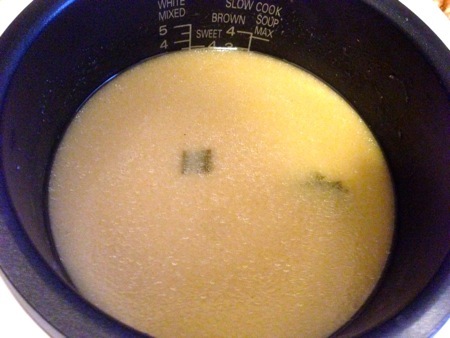 I chilled the chicken in ice water and used some of the stock to cook the rice. Unlike my method, which uses a sautée pan with ginger, garlic, and scallion tops, I used a rice cooker and added the fragrance oil, which consisted primarily of roasted garlic paste and more pandan. 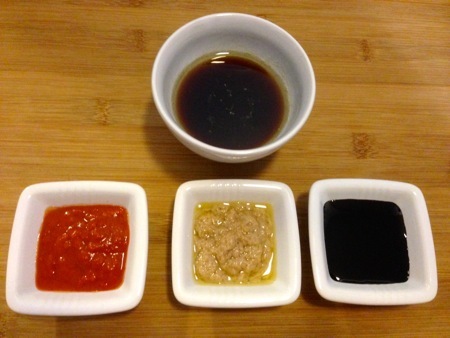 While the rice cooked I warmed up the soy sauce packet and emptied the garnishes into serving bowls. Instead of shredding the chicken, I tried the more traditional chopping with a cleaver. I plated the chicken with the rice and some sliced cucumber. He Who Will Not Be Ignored was skeptical that the dish would match mine, but none of us had an authentic baseline against which we could compare. 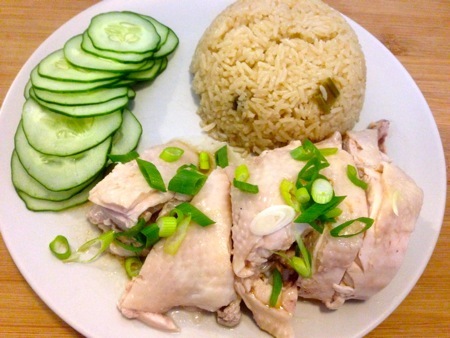 But this was a fine example of chicken rice, the most noticeable difference being the rice, which had sweet roasted garlic flavor – a huge improvement. I think my version of the chili lime ginger sauce was better then the straight-up chili sauce provided, but I like the idea of having a separate ginger sauce to mix to taste. So what is made more convenient by using the mix? You still have to poach and chill the chicken and cook the rice in the stock. I always have dark soy in the Belm Utility Research Kitchen, and keep one-meal portions of the chili sauce in the Deep Storage Facility along with quarts of the leftover chicken poaching liquid. It comes down to the roasted garlic paste and pandan leaves, one of which I can prepare and freeze in portions, the other of which will require a trip to H Mart. 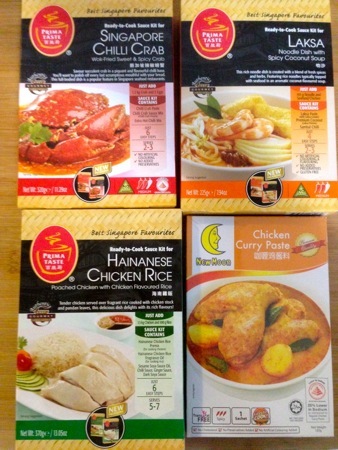 Amazon carries many of the products made by Prima Taste, but not the Hainanese chicken rice mix (conformed by another Singaporean native as “the best brand.”) I guess I’l have to rely on reverse engineering until I can work out a trade exchange with Singapore, perhaps maple syrup for chicken rice mix. That leaves the chili crab mix, which could be difficult. The only ingredient I have to supply is a 2.2 kg Sri Lankan crab. Any suggestions? I would offer to trade Maple Syrup (maybe yucca syrup too) and your favorite bbq sauce for the mixes. For me it’s Sonny’s Mustard base South Carolina bbq sauce. Yum! Thanks for the eBay tip, I just bought a 100g pack. Okay, I have to ask…what is that with the pink swirl in the center? 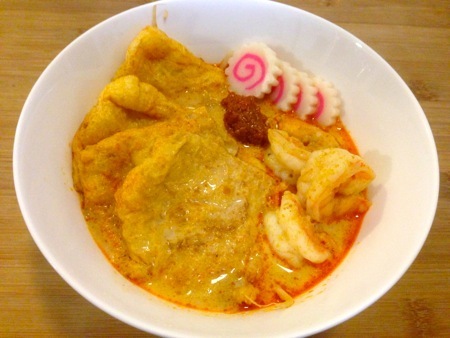 It’s Japanese fish cake, also known as naruto. The main character in the Naruto anime series has the same spiral on his forehead.